City Wanderers are looking for a friendly next Sunday morning (home or away). Anyone interested, please contact Noel @ 086 2452418. 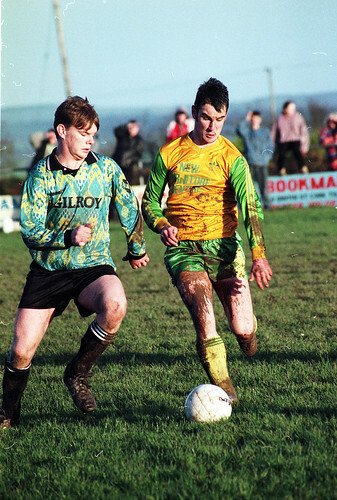 Cappry Rovers v Innishvilla, Donegal. 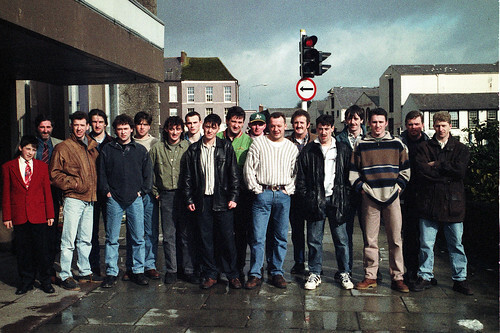 AUL juniors head for Lim Mar 95 R234, a photo by CorkBilly on Flickr. 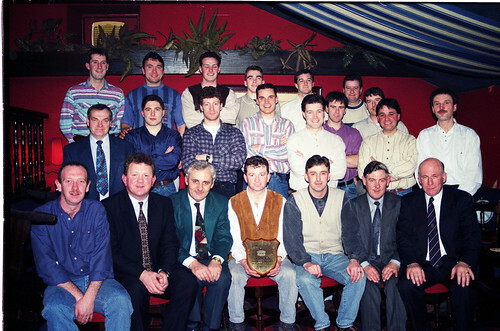 The AUL Oscar Traynor squad leave the Opera House for an Oscar Traynor date in Limerick in Mar 1995. Manager Martin Heffernan is pictured second left. Click on image for more pics from this time. The Greenwood FC Kids from U9,U10, U11,U12 and U13 are holding a charity blitz in aid of The Children's Leukaemia Association,9 Dyke Parade,Cork in the St.Finbarrs Club Togher on Saturday 29th Dec from 11am till 2pm. Greenwood FC Kids raised a total of €500.00 in a Charity Blitz in aid of The Children's Leukaemia Association last year and are looking to equal or even surpass that amount this year !! So please come along and support a good cause !!!! Mayfield ToM No 3 Jan 95 R228, a photo by CorkBilly on Flickr. Mayfield Utd receive their Team of the Month Award in 1995. To see more pics from around that time, just click on the image. The Management committee of the Cork AUL would like to express their deepest regrets on the death of Frank Casey and to extend their sympathy and support to his family and friends. Frank refereed in the Cork AUL for many years along with working as a referee inspector and assessor. Passage #3 Dec 94 R223, a photo by CorkBilly on Flickr. 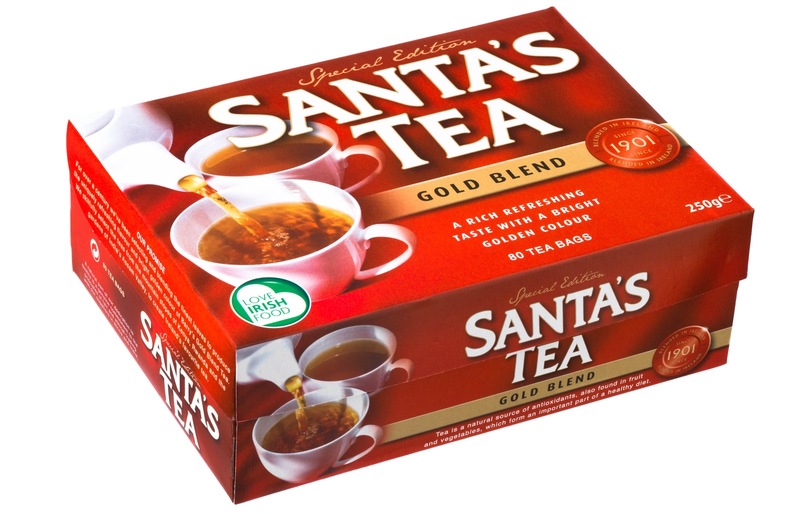 Barry’s Tea has created a very festive limited edition Santa’s Tea box which is for sale exclusively on barrysteashop.ie for tea fans at home and abroad. The box retails at €3.49 and is the perfect stocking filler for young and old. The Barry’s Online Tea Shop also hosts the full Barry’s Tea range and a plethora of tea gifts for the entire family. The Online Shop was created to help the needs of tea fans living abroad who may not have access to their favourite tea brand. Tea fans should take note that the final postage date for sending a box of Santa’s Tea to a loved one within Ireland is December 19th. 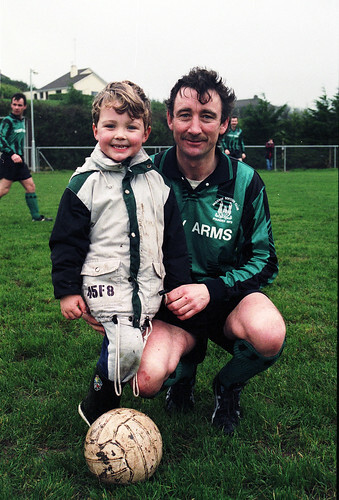 Rockmount Hibernians U17s Dec 94 R220, a photo by CorkBilly on Flickr. Darren Roche (Hibs) and right Ray Peelo (Rockmount). To see more pics from this time, click on the image. All players are requested to be at Turner's Cross this coming Wednesday at 6.30pm sharp. Athenry FC v Claremorris FC or Ballina Town or Kilbarrack Utd. St. Kevins Boys v Ringsend Rvs or Ringmahon Rgs. Murphy Youths Cup first round: Mayfield United 1 St Mary’s 1 (Mayfield United win 3-1 on penalties). Teddy Healy Cup first round: Carrigaline United A 0 Riverstown/Brooklodge 3. FAI Umbro Youth Cup: Buttevant 4 Carrigaline United 2. Murphy Youths Cup first round: Macroom 2 Wilton United 2 (aetm Macroom win 12-11 on penalties), Killumney United 1 Blarney United 1 (aet, Killumney United win 3-2 on penalties), Castleview 6 Avondale United 1, Crosshaven 1 Ringmahon Rangers 3, Ballincollig 4 Castlebridge Celtic 3, Everton 1 Cobh Wanderers 7. Daly Industrial Supplies U18 Premier League: College Corinthians 1 Leeds 2. Daly Industrial Supplies U18 League 1: Youghal United 7 Douglas Hall A 1. Teddy Healy Cup first round: Mayfield United 4 Douglas Hall 1. FAI Umbro U17 Cup: Castleview 2 Strand United 0. Teddy Healy Cup first round: Ballincollig 1 Carrigaline United 2, Ringmahon Rangers 0 Springfield Ramblers 5, Blarney United 0 College Corinthians 8, Mallow United 6 Everton 0, Avondale United 1 Bandon 4, Kinsale 1 Park United 1 (aet, Park United win 3-1 on penalties), Midleton 7 Lakewood Athletic 1. Daly Industrial Supplies U17 League 1A: Kanturk 4 Douglas Hall A 0. Daly Industrial Supplies U19 League Cup first round: Bandon 2 Greenwood 1 (aet). Daly Industrial Supplies U19 League: Carrigaline United 3 Midleton 0. FAI Junior Cup 5th Round: Glen Celtic B v Carrick United, Glen Park, 2pm, D. Deady (Ref), B. Dowling and T. Cotter. Premier A: Kilreen Celtic v Douglas Hall, Murphy’s Farm, 2pm, M O’Farrell. AOH Cup 3rd Round: Macroom A v Killumney United. City Challenge Cup 1st Round: Glenthorn Celtic v Glen Celtic B.
FAI Junior Cup 5th round: Killumney United v Clonmel Celtic, (Venue Later), T. Cotter (Ref), T. Long and D. Cronin. The Management and players of Leeview FC wish Glenvale's Michael McBride a speedy recovery from his broken nose suffered in to-day's action at the Regional Park. FAI Junior Cup 4th Round: Fermoy 0 Glen Celtic B 4; Glenthorn Celtic 3 Killumney Utd 7 (aet); Douglas Hall AUL 0 College Corinthians MSL 1; Innishvilla A 3 Glen Celtic A 1. FAI Junior Cup 5th Round: CK Utd 1 Pearse Celtic 2. AOH Cup 4th Round: Hibernians 1 Lakewood Ath 2 (aet); Carrigtwohill Utd B 0 Ballinhassig A 3; Glenvale 1 Leeview Ath 1 (Leeview won 5-4 on pens aet). City Challenge Cup 1st Round: Fairview 0 Hillington 3. County Cup 1st Round: Donoughmore Ath 0 Knockraha 3; Newmarket 2 Waterloo 3. Premier A League: Carrigtwohill Utd 6 Blackstone Rovers 0; Kanturk 2 Grattan Utd 0; Leeds 0 Kilreen Celtic 9. AUL 2: De Courcey Albion 3 Strand Utd 4. AUL 2A: Park Utd 4 Central Rovers 0; Shandon Celtic v City Wanderers (off); St John Boscos v Dunbar Celtic (off). AUL 3: Ballinhassig B 1 St John Boscos 3; Afton Villa 3 Ard Na Laoi 1; Greenwood 4 UCC B 0. AUL 3A: St John Boscos 0 Evergreen 1; Dunbar Celtic 0 Knocknaheeny Celtic 4; Tower FC 4 Carrigaline Utd 2. Los Zarcos are looking for a friendly this Saturday, an away game at 2pm. All players in the panel are requested to be at Moneygourney this coming Wednesday at 7.30pm sharp to prepare for a challenge game against Passage - kick-off time 8pm. With the Christmas period almost upon us, space on the Evening Echo will become available so, if you have anyone in your club that you would like to have acknowledged and recognised for the work they have done over the years and would like to see it exposed on the Echo, please give me a shout. The following would be some of the criteria that can be used to help identify such people. 1. Someone who has given substantive yet unrecognized contribution for a significant length of time for their club and sport. 2. Someone who has maintained the drive over the years who goes that extra mile to make all the difference. 3. Someone who was the driving force behind many of the significant projects and objectives for their club over the years. But, in general, you the clubs will be the best judges as to who your unsung hero or heroes really are. If you think you have someone at your club who fits this criteria and who has NOT got previous recognition, please let me know and I will arrange to have him\her profiled on the Evening Echo pages over the Christmas. FAI U18 Cup second round: Mayfield United 1 Castleview 4. Daly Industrial Supplies U19 League: Carrigaline United 6 Greenwood 1. FAI U18 Cup second round: Leeds 2 Youghal United 0, Castlebridge Celtic 3 Ballincollig 3 (Castlebridge Celtic win 5-3 on penalties), Douglas Hall 2 Macroom 1, Cobh Wanderers 1 Ringmahon Rangers 1 (Cobh Wanderers win 5-4 on penalties). Daly Industrial Supplies U18 Premier League: Fermoy 3 College Corinthians 5, Blarney United 1 St Mary’s 1. Daly Industrial Supplies U18 League 1: Killumney United 7 Avondale United 0. Daly Industrial Supplies U19 League: Leeside 0 Blarney United 1. FAI U17 Cup third round: College Corinthians 6 Springfield Ramblers 0, Douglas Hall 0 Midleton 1. Daly Industrial Supplies U17 Premier League: Carrigaline United 4 Avondale United 1, Mayfield United 4 Rockmount 1. Daly Industrial Supplies U17 League 1A: Kinsale 1 Riverstown/Brooklodge 6, Grenagh 0 Leeds 2, Douglas Hall A 1 Carrigaline United A 2. Daly Industrial Supplies U19 League: Temple United 1 Wilton United 1, College Corinthians 6 Riverstown/Brooklodge 1. Oscar Traynor Trophy: MSL 0 Cork AUL 3. FAI Junior Cup 4th Round: Rockmount (MSL) 2 Park Utd A 3 (aet). Saxone Cup Final: CFC Banteer 1 Hibernians 1 (Hibs won 5-4 on pens aet). Mossie Linnane League Cup Final: Blarney St Ath 0 Killumney Utd 2. Munster Junior Cup 3rd Round: Kanturk A 6 Macroom A 3; Greenwood A 1 Douglas Hall 1 (Greenwood won 5-4 on pens aet). St Michaels Cup Semi Finals: Village Utd 1 Millstreet Celtic 0; Glenthorn Celtic 0 Riverstown – Brooklodge 1 (aet). Corinthians Cup 1st Round: Bweeng 3 Blackpool Celtic 1; Churchvilla 2 Ballinhassig A 4 (aet); Carrigaline Utd v Waterloo (5pm); Macroom B 3 Grangevale 1; Greenmount Rangers A 2 Buttevant B 0 (Abandoned 75 mins); Buttevant A v Ballincollig (off); Castlelack 0 Killowen 5; UCC B 3 Rathcoole Rovers 2; De Courcey Albion 9 Parkview Celtic 0; Dillon Cross Ath 6 Ballinhassig B 1; Fairview v Tower FC (off); St John Boscos C v Casement Celtic (off); Richmond B 0 Dunbar Celtic A 5; Kanturk B v Glenvale (off); Watergrasshill v Innishvilla B (off). Premier League: Pearse Celtic 4 Knockavilla Celtic 1; Springfield v Castleview (off). Premier A League: Kilreen Celtic 3 Grattan Utd 0; Innishvilla v Bohemians (off); Glen Celtic A v Blackstone Rovers (off). AUL 3B: Rylane Celtic v Greenmount Rangers (off); Glanworth Utd 2 Los Zarcos 2; Coachford v Newmarket (off). Hibernians celebrate after being presented with the Saxone Cup following their 5-4 penalty shoot-out victory over CFC Banteer at the Cross on Friday night. It was 1-1 over extra time. Saturday 8th December Ko. 2.00pm Unless Otherwise Stated. Cork AUL v Kerry District Leage, Turners Cross. FIXTURES: There is a delay with the fixtures this evening. I should have them around 10.30pm tonight. Will put them up straight away upon receipt. Cup Finals: Don't forget the two big attractions at the Cross Friday and Saturday night. Friday: (Saxone Cup Final) Hibs v Banteer - Saxone Cup Fina @ 7.30pm. 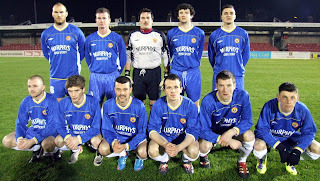 The Cork AUL Team that defeated the MSL 3-0 in their Oscar Traynor clash at the Cross on Wednesday night. The AUL nosed in front after dreadful defending by the MSL allowed Colin Stack to touch home the opener on 15. Further sloppy defending from the MSL followed and two minutes later, the Cork AUL doubled their advantage when Stack got his second after finding the bottom right-hand corner with a crisp finish. The MSL were playing well and seemed to knock it around comfortably but, it was Stack who had a great chance to complete his hat-trick when he blazed over with the goal in sight. 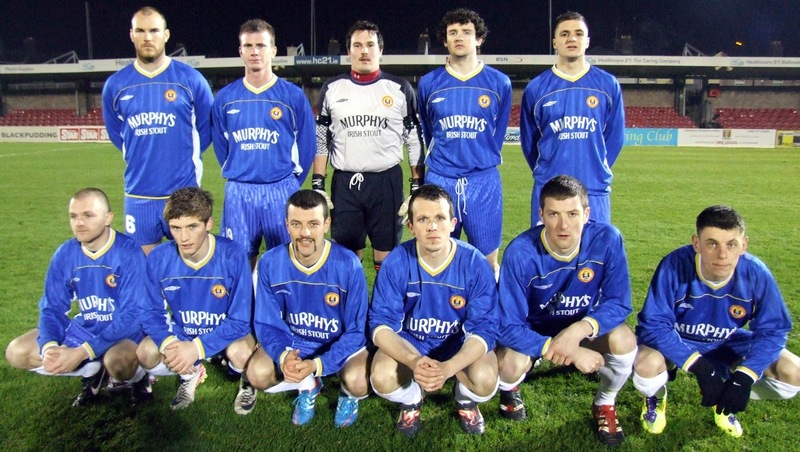 But, it was 3-0 to the AUL when Darren Lynch finished well in the 77th minute. From here on the Cork AUL were well in control and if it were not for some super goalkeeping from Carlo Gleeson, the AUL could have won the game much more comfortably. Once again, Anthony Peelo was superb at the back. Stephen O'Sullivan in goal had a solid performance and did nothing wrong. Mark Nolan was decisive in midfield whilt Darren Lynch and John Corcoran worked hard up front. Impressive though were the subs that came on. Howard Coakley showed tremendous skill on the ball when he got the chance and Dave Dineen also made a big impression as did Eamon O'Sullivan. Overall it was a decent performance and if I was to be critical, I would say - we gave the possession away far too often. Players going for the ridiculous pass instead of the more effective one. All at Corkbeg AFC are deeply saddened to learn of the passing of former Corkbeg player Rob Savage over the weekend. Rob featured in the Corkbeg junior team a few seasons ago before a serious injury curtailed his playing career with the club. Rob moved on to bigger and better things as physio to the Cork City team that gained promotion back to the League Of Ireland Premier Division and was a hugely popular figure among his team-mates. Everyone at Corkbeg would like to express their deepest sympathies with the Savage family at this extremely difficult time. Please note: There will be a delegate meeting at the Ambassador Hotel on Wednesday, 5 December at 8 o’clock sharp. Team of the Month (November): Do you want to be in the running for the Murphy’s Irish Stout Team of the Month for February? Get your entries in to Henry Healy, 19 Inniscarra Road, Fairhill, before Friday, December 7. Oscar Traynor: MSL v Cork AUL, Turner’s Cross, Wednesday, November 28 (7.30pm). AUL v Kerry, Turner’s Cross, Wednesday, December 12 (7.30pm). Saxone Cup Final: Hibernians v CFC Banteer, Turner’s Cross, Friday, November 30 (7.30pm). 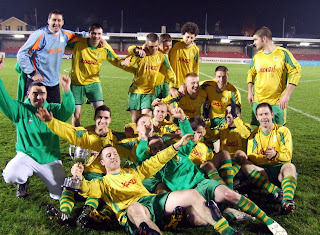 Mossie Linnane Cup Final: Blarney Street Ath v Killumney Utd, Turner’s Cross, Saturday, December 1 (7pm). For Wednesday's game against the MSL, all players are requested to be in Turner's Cross at 6.15pm sharp. There was 22 games cancelled this weekend due to the inclement weather conditions. FAI Junior Cup 4th Round: Fermoy v Glen Celtic B (off); Pearse Celtic 5 Carrigtwohill Utd A 0; Glen Celtic A v Innishvilla A (off); Fairview 2 Richmond A 3; College Corinthians v Douglas Hall (AUL) (off); Killumney Utd v Glenthorn Celtic (Off). City Challenge Cup 1st Round: Central Rovers 1 Village Utd 1 (Village won 4-3 on pens aet); Cathedral Celtic v Greenmount Rangers B (off); Leeview Ath 5 Blackpool Celtic 0; Shandon Celtic v Grangevale (off); Parkview Celtic 2 Greenmount Rangers A 1; Glenvale v Knocknaheeny Celtic (off); City Wanderers v Afton Villa (off); Dillons Cross Ath v Casement Celtic (off). County Cup 1st Round: Carrigaline Utd v Hibernians (off); Los Zarcos v Innishvilla B (off); Coachford B v CFC Banteer (off); Killowen 6 Buttevant B 2; Ard Na Laoi v Rylane Celtic (off); St John Boscos C v Carrigtwohill Utd B (off). Presidents Cup Semi Final: Dunbar Celtic B v Newmarket (off). Premier A league: Leeds v Blackstone Rovers (off). AUL 1: Ballinhassig 5 Watergrasshill 2. AUL 1A: UCC 3 Millstreet Celtic 3; Buttevant v Rathcoole Rovers (off). AUL 2: De Courcey Albion v Donoughmore Ath (off). AUL 3: UCC v Richmond (off). AUL 3A: Tower Ath v St John Boscos (off); Greenwood 3 Castlelack 3. Richmond A are looking for a friendly next weekend. MSL v Cork AUL, Turners Cross. MSL.